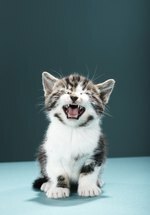 Why Is My Kitten Not Eating? Welcoming a new kitten into your home is one of life's great moments, but it's not all fun and cuddles and Instagram hashtags. With your new pet, comes new responsibilities — and chief amongst them is ensuring that he has access to a healthy, nourishing, and diversified diet. But what if your kitten is not eating? You can trace a reluctance to nom nom nom to any number of factors, some more concerning than others. Any prolonged loss of appetite usually indicates illness or injury. If your kitty hasn't eaten in 24 hours, get her to a vet quickly. This is particularly important if she seems lethargic or is showing signs of weight loss. Remember: Kittens by their very nature are energetic and playful, and most of the calories they consume fuel their growth and development. Any variation in eating behaviors is alarming. It's possible you're dealing with something serious like an illness or kidney failure, but it could also be something much less threatening, like a tooth infection. Vaccinations can also dampen your little guy's appetite, but this is typically mild and passes in a day or two. No one likes to eat from a dirty dish, and kittens are no exception. To this end, wash your pet's bowl or plate daily and toss any leftover scraps between meals. While plastic is easy and cheap, it's also less germ-resistant. For this reason, some cat care professionals recommend that you upgrade to metal or ceramic if at all possible. Another complication can stem from the size and shape of the receptacle. Deep or narrow bowls, for instance, can interfere with a cat's whiskers, which might encourage her to shy away. Cats typically prefer to eat in private, so find a quiet feeding corner or nook where foot traffic from people and other pets won't disturb your kitten's meals. If competition from other cats (or kittens) is giving your little one anxiety, you'll need to develop a workaround in some sort of space where he can dine in peace. Cats are creatures of both comfort and routine. If you have a lethargic kitten who isn't eating regularly, it might be because you're not feeding her regularly. If possible, establish a schedule — say once in the morning and then again at night — and keep to it. If you can't be home during the day because of work, school, or travel commitments, invest in an automated feeder that you can program to dispense the noms in prescribed amounts and at prescribed times. At the same time, changes in a routine — a move to a new home, a trip, a new schedule or baby — can leave a cat unsettled. They usually come around to their new reality, but it can take some time and the transition isn't always a smooth one. We all love a hot lunch from time to time, and kittens are no different. While the food shouldn't be piping hot, warming some wet food up in the microwave for a few seconds can entice him to wolf down their meal. Heat activates a food's odor, making it more likely that your kittens will come a running when you go to prep their breakfast, lunch, or dinner. Would you want to eat the same exact thing every single day? Probably not, and neither does your new little bestie. Experimenting with different brands, consistency (wet and dry), flavors (fish, chicken, beef), and the like can bring a kitten who doesn't want to eat back to her dish in a hurry. The same is true of peppering their dish with something like bonito flakes or cat vitamin powder. To reduce boredom, food allergies, and digestive issues, some experts recommend changing up your cat's diet two to four times a year. What Live Plants Do You Use With Beta Fish? Is a Cat Sleeping in Unusual Places a Sign of Sickness?